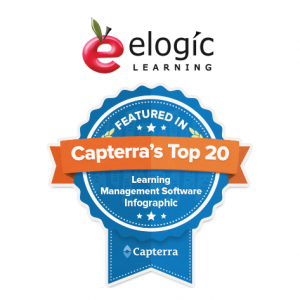 eLogic Learning is proud to announce the eSSential Learning Management System (LMS) was named a Top 20 Most Popular LMS Software by trusted business software service Capterra. Capterra provides the results of their learning management software industry research in The Top LMS Software List and infographic (see below). The list is refreshed on a quarterly basis to stay current with the quickly changing and growing industry of hundreds of LMS solutions providers. eLogic Learning has recently broke into the Top LMS Software list as a result of the company’s increasing customer base with over five million monthly users as well as its growing visibility and social media following. “eLogic Learning has received consistently good reviews from their clients, and we’re excited to see them break into the Top Most Popular LMS list,” says Yeoman.